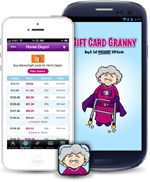 Access money-saving discount gift cards anywhere you go! For specific instructions and tips for using your gift card, search from Granny's list of over 1,000 popular brands. To check the balance of your gift card you will need the card number and, if applicable, the PIN or security code located on the back of the card. Most retailers & restaurants allow you to check the balance online, by calling the toll-free number located on the card, or by visiting them in person.